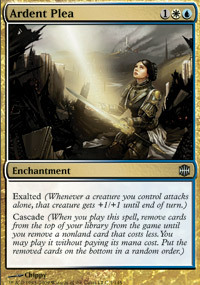 © Wizards of the Coast, Inc. 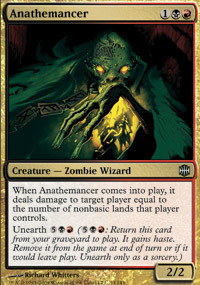 When Anathemancer comes into play, it deals damage to target player equal to the number of nonbasic lands that player controls. 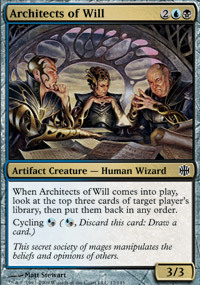 When Architects of Will comes into play, look at the top three cards of target players library, then put them back in any order. 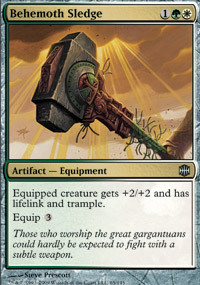 As Arsenal Thresher comes into play, you may reveal any number of other artifact cards from your hand. 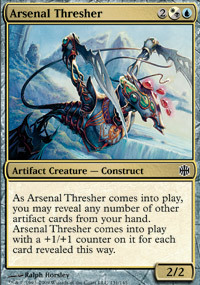 Arsenal Thresher comes into play with a +1/+1 counter on it for each card revealed this way. 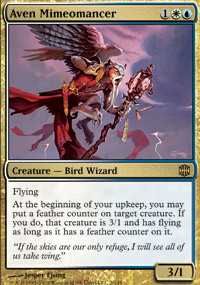 At the beginning of your upkeep, you may put a feather counter on target creature. If you do, that creature is 3/1 and has flying as long as it has a feather counter on it. 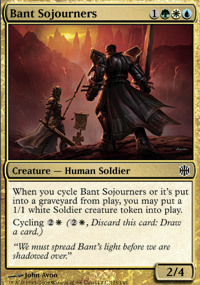 When you cycle Bant Sojourners or its put into a graveyard from play, you may put a 1/1 white Soldier creature token into play. 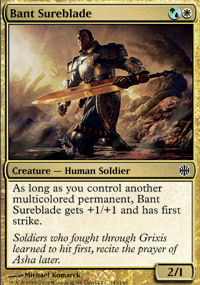 As long as you control another multicolored permanent, Bant Sureblade gets +1/+1 and has first strike. Equipped creature gets +2/+2 and has lifelink and trample. At end of turn, Blitz Hellions owner shuffles it into his or her library. © 2012-19 magic-spielen.de. All Rights Reserved. 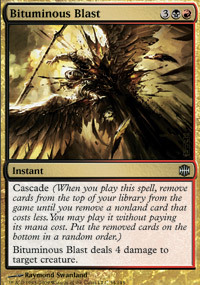 Zahlreiche Infos für Einsteiger und Hobbyspieler rund um das Sammelkartenspiel Magic: The Gathering, wie z.B. Erklärungen zu Spielregeln, spieltechnischen Fachbegriffen und Varianten des Spiels.